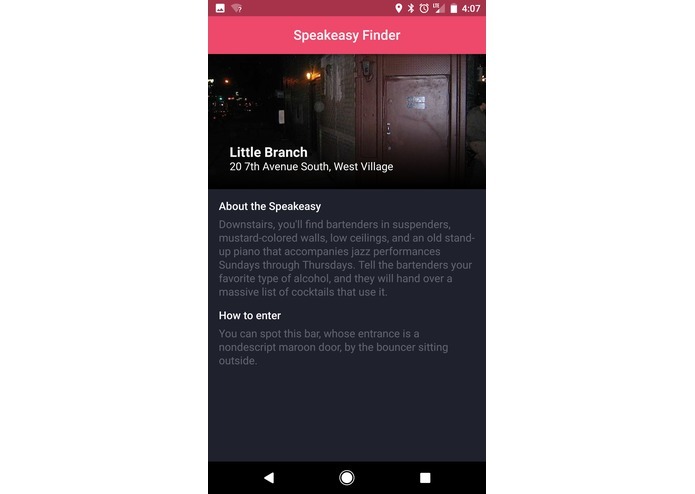 Mobile app to find a speakeasy bar in NYC… the speakeasy way. I always find interesting the way most of Speakeasy bars are: you need a password, or you have to know a secret door, or you have to open a door in a random place. Is a directory of speakeasy bars in NYC, but to access the information of them, you have to solve a riddle. I built it with Fuse, a framework to make native mobile apps. I use Loopback to access the API for the list and the visual recognition API of Watson for the riddle. Learning Loopback and making the whole app in such short amount of time without being a full time developer. I couldn't get Watson recognition image service to work, because I can't send a raw image to the service.